Thing One: I finished binding my first finished quilt of the new year! See above, my lovely quilt model Paige modeling it. I started working on this quilt late last year after a long quilting slump. We had just finished moving houses and I hadn’t sewn anything in months…so to get out of my slump I started making these houses one by one. The pattern is called Dwell which can be found in the book, Simply Retro, by the talented Camille Roskelley. The beautiful fabrics are Tilda from Pretty Fabrics and Trims. Thing Two: Please see below. 😉 I have been working so hard on this secret project and am so excited/nervous to finally share it with you. Please stay tuned for more hints coming your way! The big reveal will happen in a few weeks. The little brown house with the heart and no chimney represents our new house (we recently moved to Ballard, Seattle). Home is where the heart is. =) And the green house with a red door to the left of it was our old house. The long arm quilting was done by my amazing friend Monica at It’s Just Sewing. Thanks for reading me! It’s a little past 1:00 in the morning here, hence the “short and sweet post.” 😉 Hope you all have a wonderful week ahead! 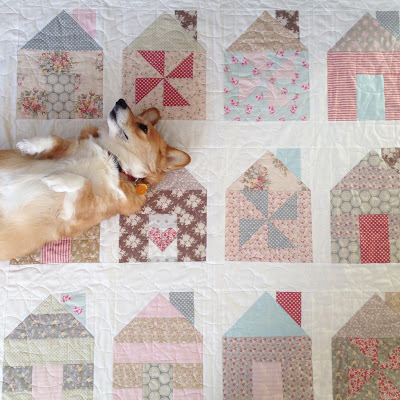 Love your beautiful House Quilt. Especially the heart in the door for your 'new' house! Very beautiful and appropriate for getting back to quilting! Looking forward to your surprise. I just love houses, but haven't make a quilt yet. This seems like something I could tackle. Your's is so sweeet. I'm taking a guess here, but this is not the quilt as your go process, Right? Hello! I did not use QAYGo for this one, but I easily could have. 🙂 My next book will discuss more how to do that, along with a new joining method. Thanks for the comment! I have the Simply Retro book and have thought about making that quilt. 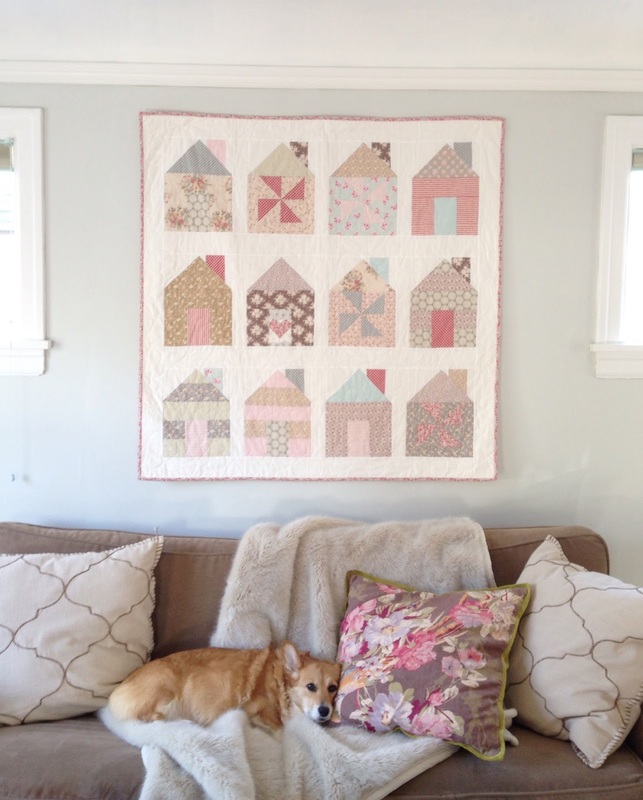 I love the houses and the Tilda Fabrics are so pretty. I am inspired, now to find some time to sew. Wow. It`s a winner,love everything about it! Beautiful quilt! And Ballard! A fun, interesting neighborhood! I enjoy visiting, but eastern WA is my home! 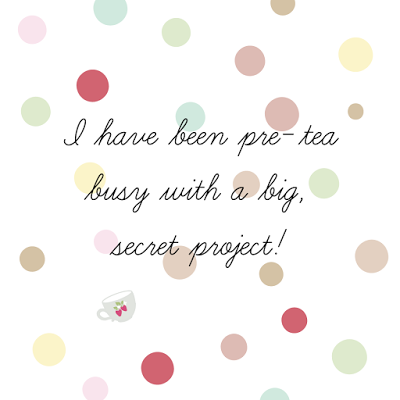 Can't wait to see what your secret sewing/creating is! Have a great day! 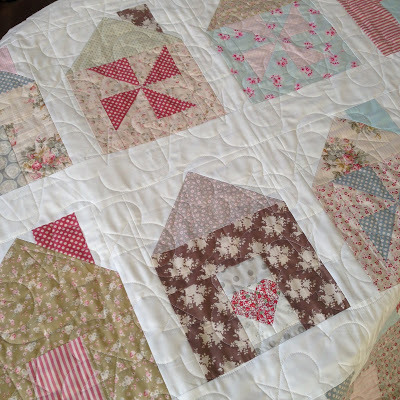 That's a beautiful looking quilt with a lovely mix of fabrics. Thank you for the great tuition, I love this quilt! So off I go to get some fabrics! would buy from you but you are sooooo far away, would take ages to get here!